I often come across travelers, who can’t seem to stop complaining about a tourist destination becoming too popular and commercial, which at times, kind of sounds ironic. Since the person complaining is him/herself a traveler and is thus contributing to the sea of humanity and commercialization. While I personally like to avoid crowded touristy places, one such destination has a soft corner in my heart. Not only because I went there on my first ever motorcycle trip, but also due to its natural beauty and aura, which still manages to enchant me. In case you haven’t guessed it, that place is Manali. I first went to Manali in October 2004 and then again in November 2004, June-July 2005, September 2005, September 2006, June 2007 and September 2007. While only the first three visits were truly dedicated to Manali and rest were part of my Ladakh and Spiti trip. 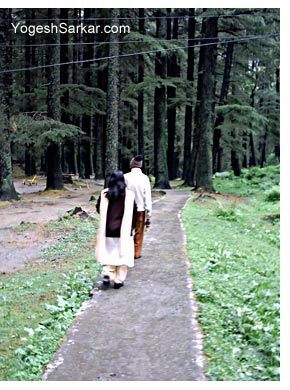 I never the less, always enjoyed that place and I am once again planning a dedicated trip to Manali in the coming months. Even though over the years, I have seen it transform from a somewhat quite hill station to a chaotic one, with traffic jams and rapid commercial construction. I have always felt that it still offers its visitors a chance to slip away from everyday reality, to bask in the solitude of its Natural Himalayan Beauty, to breath in awe as the eyes try their best to soak up the magical vistas around them. All this even when it is choc-a-block with tourists! Well all you have to do is take those extra steps to walk away from the crowd and discover your very own haven! Yes that’s right, even in the most crowded of holiday destinations; there are places which are seldom visited by average tourists, who seem to prefer places, where rest of the tourists are. By walking that extra mile, you separate yourself from the rest of the heard and get a different perspective and view of the place you are in. Usually that extra mile not only gets you the solitude you wanted, but also ensures that you discover places which are undisturbed by the effects of tourism and thus manage to retain the specialty, which made that place famous amongst tourists in the first place. So the next time you go to a popular tourist destination, instead of complaining about the crowd and walking straight into it, walk away from them and rediscover the original charm of that place. Why you should do Srinagar – Leh Highway!